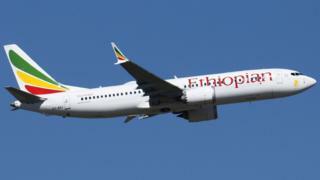 All 157 people on board were killed when flight ET302 from Addis Ababa to Nairobi came down on 10 March. Reports suggest an anti-stall system on the Boeing 737 Max has been highlighted as the cause of the crash. Two minutes into the flight – at just 450ft (137m) above the ground – the aircraft’s nose began to pitch down, according to the Wall Street Journal. The newspaper, which says it’s spoken to people close to the ongoing crash investigation, says the captain fought to control the plane when it began to dive. The detailed report says one pilot said to the other “Pitch up, pitch up!” before the radio went dead and as the plane “accelerated” towards the ground. The Wall Street Journal says the information it has “paints a picture of a catastrophic failure that quickly overwhelmed the flight crew”.